Ben Simmons is one of three unanimous 2017-18 NBA All-Rookie First Team selections. 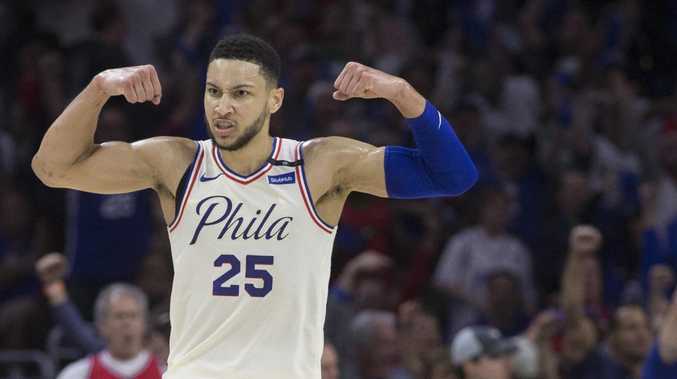 AUSTRALIA'S Ben Simmons did not win an NBA title with the Philadelphia 76ers in his first year in the league, but he has just picked up a major honour. Simmons was unanimously selected to the 2017-18 NBA All-Rookie First Team after receiving first-place votes on all 100 ballots from a global panel of sportswriters and broadcasters. Utah Jazz guard Donovan Mitchell also received a perfect vote and place in the All-Rookie First Team. The announcement adds to the intrigue ahead of the announcement on June 25 of the NBA's Rookie of the Year award, with Simmons and Mitchell dual favourites. Boston Celtics forward Jayson Tatum, with 99 First Team votes, fell one vote shy of joining Mitchell and Simmons as a unanimous selection to the NBA All-Rookie First Team. The team also features Los Angeles Lakers forward Kyle Kuzma, with 93 first team votes, and Chicago Bulls forward Lauri Markkanen (76 votes). Mitchell, Simmons and Tatum are the three finalists for the NBA Rookie of the Year award. Los Angeles Lakers guard Lonzo Ball, Sacramento Kings guard Bogdan Bogdanovic, Atlanta Hawks forward/centre John Collins, Phoenix Suns forward Josh Jackson and Dallas Mavericks guard Dennis Smith Jr were named on the NBA All-Rookie Second Team. The 76ers were knocked out of the playoffs earlier this month by Tatum's Celtics. premium_icon Can LeBron James and Ben Simmons take top honours? News Rockhampton born RAAF aircraftwoman addresses the gathered crowd. Politics Come and watch your favourite candidate in action at our debate.